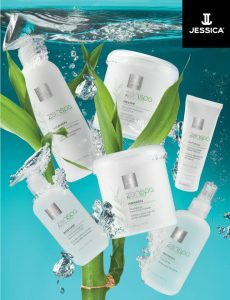 We are very excited to be launching our NEW and improved Zenspa pedicure range. Immerse yourself in the ultimate luxury pedicure treatment! Awaken your senses and discover the ultimate in professional pedicure luxury. A new look and fantastic formulas that harness the restorative powers of Asian aquatic plant extract to purify, cleanse, soothe and calm your skin. We’ve put together some speedy at-home maintenance tips for in between your treatments that will have you sandal ready all summer long. Use Jessica Zenspa Microdermabrasion Foot Scrub to exfoliate feet while in the shower or bath to remove any remaining rough skin and to perfectly smooth filed areas. Pay special attention to extra dry areas. The finely ground volcanic pumice is very effective on hard skin that builds up on feet, as it will renew skin cells and leave your feet feeling like new. Before bed apply Jessica Zenspa Hydrating Heel Repair Creme to heels and other dry areas, allow to absorb. Put on some cotton socks and you’ll wake up with silky smooth skin. To maintain your pedicure re-apply Briliance top coat every 3 days to keep your polish looking fresh and to protect the colour from fading.